That’s all I could think about as I laid in the hut above. I was certain I’d wake up cover with spider bites, with ticks sucking my blood and with mosquitos eating me alive. I knew this because I saw a gigantic spider, three ticks and countless bugs in the dirt as I built my “home” earlier in the day. Did you know 1 in 3 deer ticks carry Lyme’s disease now? I slept on a grass mat, surrounded by dried up leaves and pine needles I scraped up from the ground. I had no sleeping bag. No blanket. No pillow. Just me and the earth. A hoard of bugs. And my fear. This was all part of an experiment I’ve been testing this year to become intimate with poverty. I’ve spent two weeks this year away from everything, living in a tent in the woods. Eating oatmeal for breakfast. Stew for lunch and dinner. And stripping myself of all things ‘nice’ down to the bare essentials of living. I’ve shared this experiment with people and they think I’m nuts. “Why are you wasting your time with that? Don’t you have anything better to do” is the common response. Often, I wondered the same thing. But there, in the darkness of the night, I finally understood Senenca’s teaching. It’s one thing to read his quote. It’s another to follow in his footsteps. To take the actions he took. To feel what he felt. Laying there, in that pile of leaves and bugs, I understood why he would often deprive himself of daily luxuries of life. Wearing the same clothes. Eating the same food. Because this was how he stayed connected to his freedom. It is through stripping away everything, he learned to generate his own sense of happiness, power and peace of mind. Seneca didn’t get lost in the trap of wanting more. He didn’t become numb to the riches in his life. He stayed humble, grateful and grounded by making it a practice to experience poverty. Yet, take and objective look at America and it’s obvious we’re wildly out of balance with nature. And miserable. We live in a constant state of dissatisfaction. We have an insatiable hunger for more. And no matter how many new apps come out or what new technology gets created… we’re never satisfied. Because we, as a culture, are unhappy. And we are. We are one of the wealthiest countries in the world. Yet, when it comes to happiness scores, we are 108th out of 140 countries. Wealth does not lead to happiness. Yet, we keep trying. We are living in one of the greatest periods of history. And we don’t even realize it. We are so obsessed with more, bigger and better things, we can’t even enjoy the miracles that run our every day lives. Louis CK, who isn’t quite a Stoic philosopher, knows this too. How is it possible to have so many luxuries and be so un happy? Because we’re constantly comparing ourselves to external reference points. And that is the root of all unhappiness. Power, wealth and happiness are often held as relative. Let’s say you and your friends are making $50,000/year. And the next year you double your revenue to $100,000/year. Well, what if your friends TRIPLE their income and are making $150,000? Is that $100k still exciting? Probably not. In that scenario, it’s very likely you could double your income and be LESS happy. Because your friends grew their income faster. Why? Because your wealth, power or happiness is relative to what you’re comparing it to. The reason we can have such high production levels and low happiness levels in America is because most people live ‘externally referenced’ lives. James Altucher wrote a post about the six diseases billionaires have. One of the most common? They’re jealous. Do the numbers actually matter? Nope. His sense of power, wealth, and happiness comes from how he ‘stacks up’ to other people. It’s not sourced from within. So he is eternally striving for something he can never achieve. I don’t care how much money you make or how much you achieve. He is as trapt as any other person playing the “keeping up with the Jones’s” game. The Question To Ask Yourself: Are you internally referenced? Or externally referenced? If you are externally referenced, your sense of happiness, satisfaction, and power comes from comparing yourself to external factors. If you are internally referenced, it comes from within. Regardless of the external circumstances. It is a product of your very existence. Nothing else. If you are externally referenced, you’re playing a game you’ll never win. You can’t. It’s impossible. There will always be someone or something that’s better than you. When you strip yourself of everything external, you have nothing to rely on to ‘create’ your happiness. You’re forced to generate happiness. Not because of anything in particular. But because you choose to. And that is the magic in this experiment. By becoming intimate with poverty, you simultaneously become intimate with your power. You power to create. To generate. To live a life of satisfaction. After four days of eating the same food each day and sleeping on the ground with nothing external to influence me, guess what? Sometimes, uncharacteristically, deliriously happy. With nothing more than my tent, my sleeping bag (when I used it) and ample time wandering in nature. No iPhone. No Netflix. Not even any Chipotle salads. 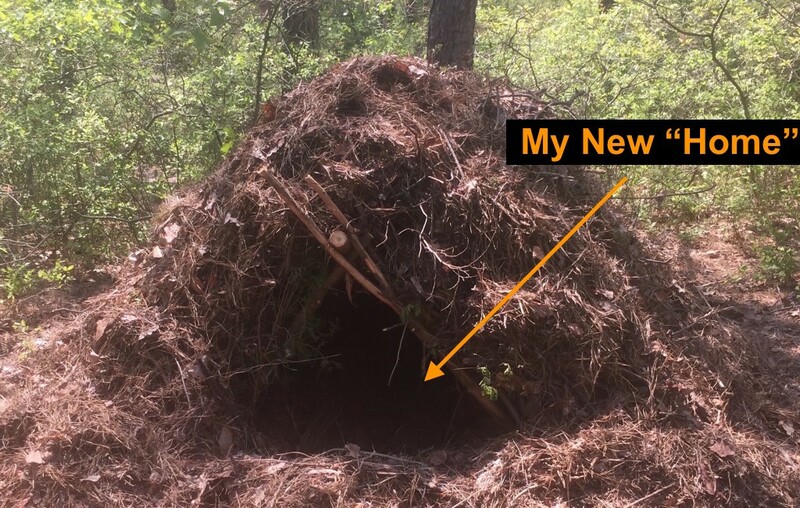 When I came back into ‘the real world,’ after a week in the woods, everything was so amazing. – A hot cup of mint tea. – Adding cinnamon to bland oatmeal. – Even the airport security line became a place of fascination instead of the place I dread. There is an immense freedom that comes from consciously choosing to taste poverty. By experiencing lack, you’ll reconnect to the truth that peace of mind and happiness is accessible regardless of anything external. Regardless of your job. Regardless of your bank account. Regardless of your relationship status. Strip yourself from all the luxuries of your daily life and see what you are left with. You might be surprised at how wonderful life actually is. PS – I only got bit by two ticks. No Lyme’s disease yet. PS – I loved the second part to Seneca’s quote about this experiment. It feels fitting to post here.